When you first start gardening, you might wonder what vegetables are the easiest to grow. My first year, I assumed everything was easy. Soon, I realized that I was wrong. Many plants have different requirements that I wasn’t ready or prepared to give to them. In fact, I had no idea plants could require anything other than sun and water. There are seven veggies that I recommend for all beginning gardeners. These plants are easy! Most of the time, they grow abundantly and will help you feel more confident to expand your choices during your second year of gardening. 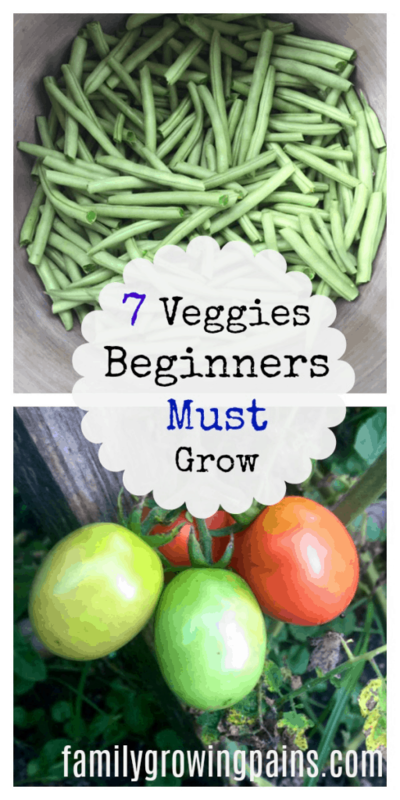 Here are my top picks for Veggies Beginners Must Grow! I love growing peas. 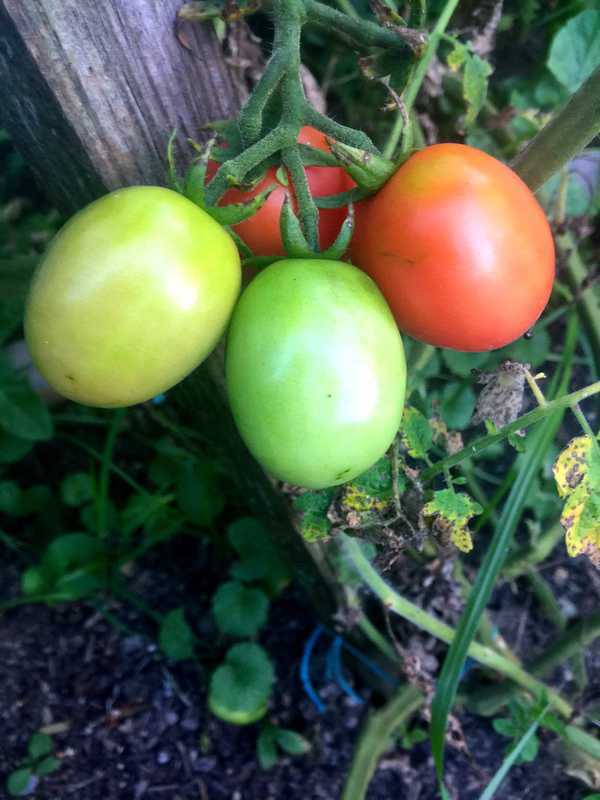 They made the cut my first year gardening, and I’ve been growing them every year since. Peas tend to be hard to mess up, at least in my experience. Peas are a cooler-weather crop, so you will plant them two to three weeks before your final frost date. They can handle the cooler temperatures. Peas also make a great choice for a fall garden! Kids can learn how to plant peas as well. I line the peas up for my kids in the area I want, then watch as they push them into the ground with their fingers and cover back up with soil. 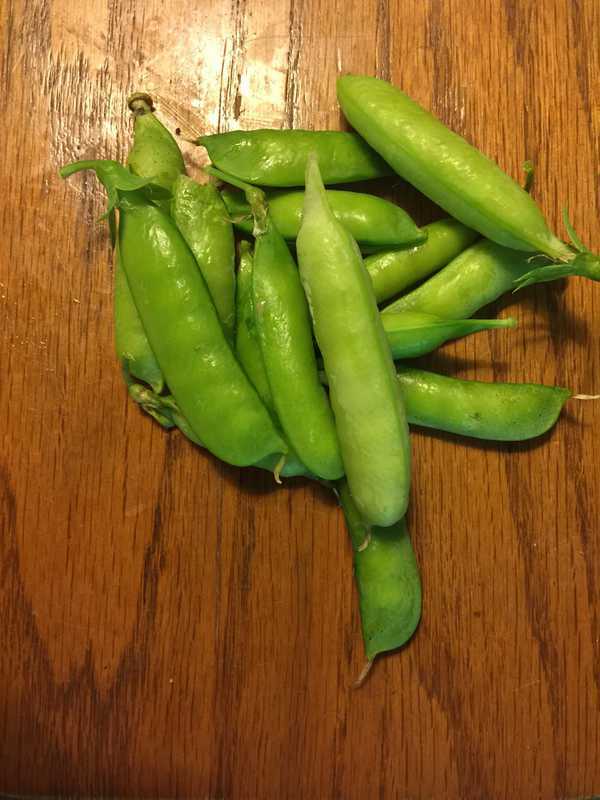 Weeks later, I find my kids picking the peas off the vine and eating them fresh! Do you love salads? If so, don’t skip the opportunity to grow your own lettuce. 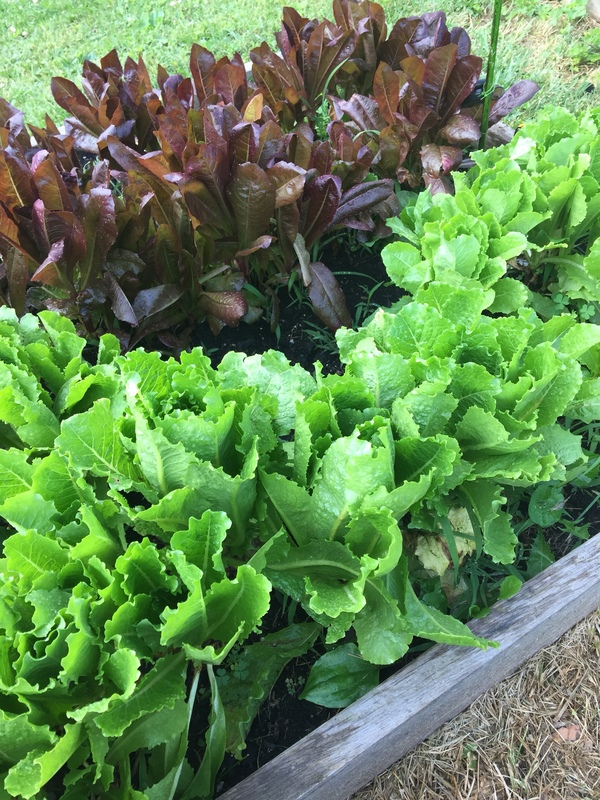 Lettuce is an ideal choice if you want to learn how to use succession planting, which will give you a fresh, continuous harvest throughout the growing season. Most lettuce and greens grow very easily. The hardest part is thinning out the seedling – those seeds are small! Also, lettuce prefers cooler temperatures, so they can go to bolt during hot weather. The ground has to stay moist. Lettuce is another plant that you will plant prior to the final frost. Plant a new row or two every two weeks to give yourself a continuous supply of fresh greens! 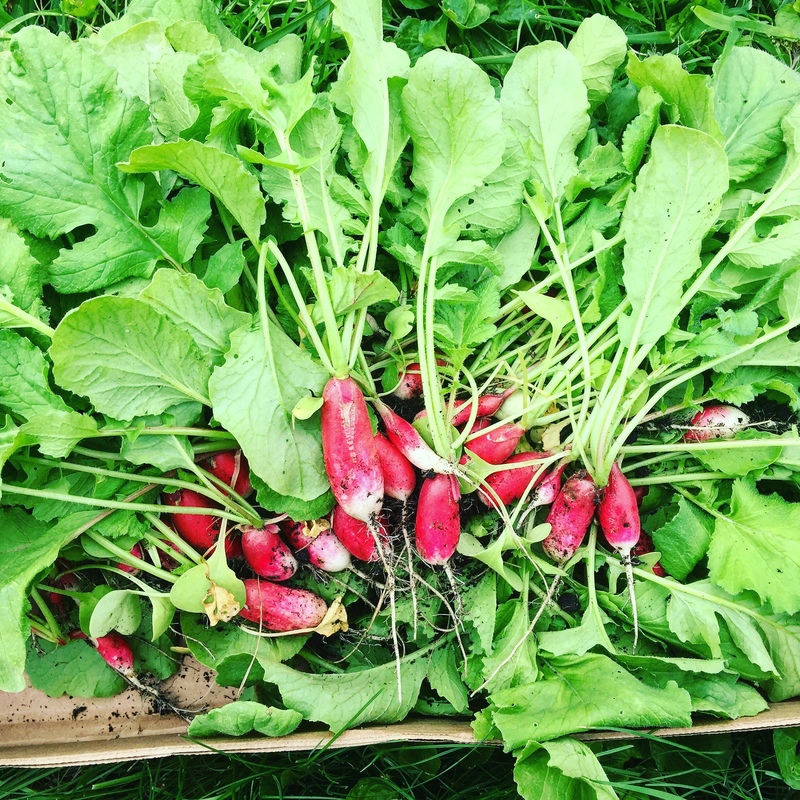 Radishes tend to be an underrated choice for gardeners. Many people don’t like them unfortunately. Radishes are delicious baked or shredded into a salad with that fresh batch of lettuce. Depending on the variety you pick, radishes can be ready to harvest in less than three weeks. That’s impressive! They make an awesome choice for kids who are impatient to see a harvest. Just like peas and lettuce, radishes are a cooler-weather crop that you can start before the final frost. Finally, a warm weather crop! I love green beans. My kids don’t love when I have pots of fresh green beans that need the ends snapped off. Little hands help lighten my load for sure. 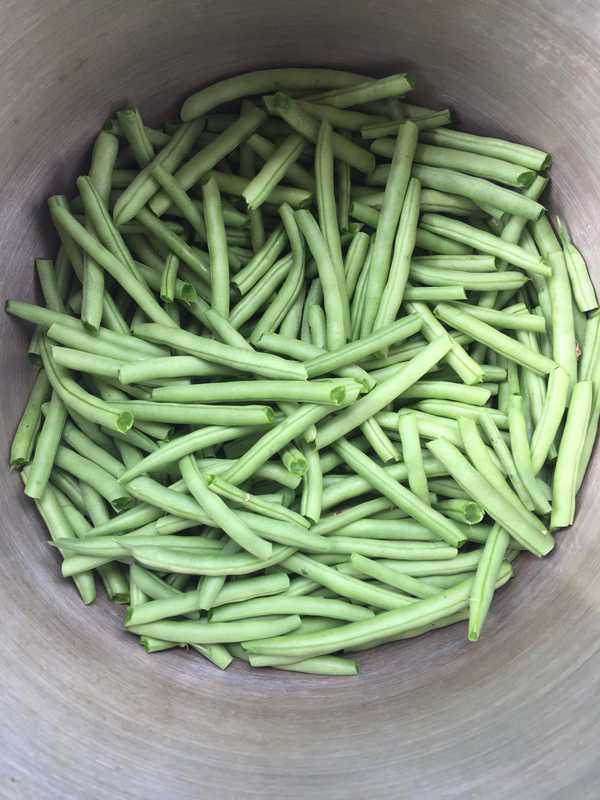 When growing green beans, you can select between pole and bush beans. Pole beans are fantastic for those who need to save space. However, in my experience, bush beans produce a better harvest. I dedicate an entire garden bed just to green beans. As soon as the final frost date has passed, you can plant your green bean seeds. There is no reason to start the seeds ahead of time; just plant them right into your garden. Read the packet to ensure you are spacing them appropriately. Some people plant a row week to stagger the harvest, allowing them to better preserve the green beans. I’ve never had a bad zucchini harvest. In fact, it seems as if I always end up with too much zucchini on my hands. I end up having to give away zucchini to everyone who will take some off of my hands. There is only so much zucchini bread, chips, and boats I can create! Plus, I can only freeze so much shredded zucchini before my husband tells me to stop. Some people like to start to their zucchini seeds inside. You can do so if you want a seedling ready for planting by the final frost date. Start them two weeks before that time. You don’t want to start them any earlier because zucchini become root-bound easily. I prefer to start the seeds right in the ground! Do you love pickles? Cucumbers are your go-to choice them! Cucumbers should be planted right into the ground once the danger of a frost passes. I love vining cucumber plants. All you need is a trellis or a make-shift fence that allows your cucumbers to grow upwards. Cucumbers grow very well vertically! My last pick for beginning gardeners is tomatoes! Yes, tomatoes can be a bit finicky at times. They don’t like standing water. They don’t like too much water. They don’t like cooler temperatures. However, if you have a hot summer with normal amounts of rain, you should have a successful tomato harvest. Tomatoes, to me, can be a bit tricky starting from seeds, so I typically tell my friends to first try started seedlings from a trusted nursery. After that, you can dive into starting them from seeds. If you have a successful tomato harvest, you will have tomatoes coming out of your ears! Tomato sauce, salsa and diced tomatoes are in your future. If you are beginning gardener, what do you plan to plant this year? Experienced gardeners, what do you recommend for newbies? Share your thoughts in the comments! 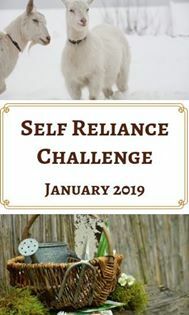 Reading your post makes me excited again for the upcoming growing season… i have a few months to plan, can’t forget onions and garlic in your list! I am just about to start a gardening class for children, as part of my job gardening at sussex university. I am already planning lettuces, peas, beans, broadbeans, tomatoes, squashes and strawberries. We will do the obligatory sunflowers too so they can see who has the biggest one. What about radishes? They grow so rapidly! My kids love being able to harvest so often. Try some herbs as well like basil! So do you typically grow two rounds of veggies – summer ones, then dig them out and plant the cooler weather ones? I recommend adding carrots to the list as well as watermelon. I found peas and carrots grow well in buckets and in all day full shade. (I am in zone 7 in Virginia USA) . Also added watermelon in edge of tomato bed. All did well. This is an awesome list! I can not wait to have my own garden. It didn’t happen this year but fingers crossed for next year. Nothing beats fresh home-grown veggies! 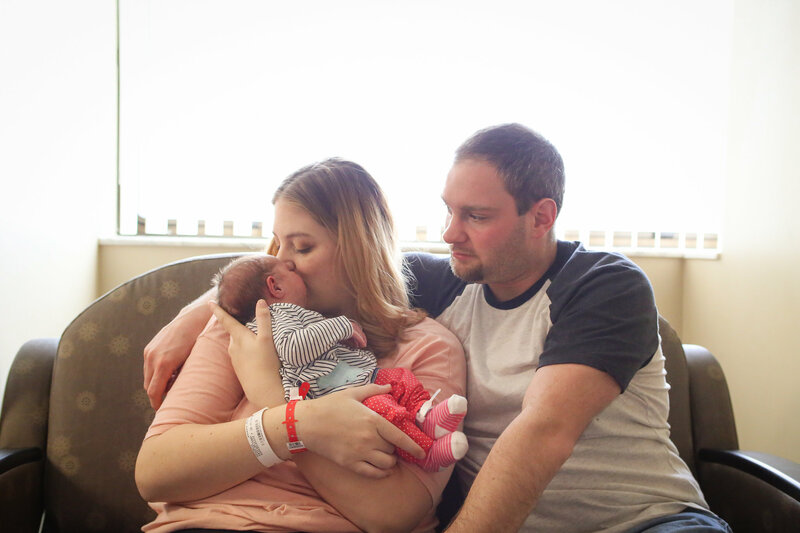 Bethany – great post and tips! I’m in the Northeast US and have yet to put my veggies in the garden. I need to get on it. Your photos are fantastic! My very favorite summer dinners are the ones in which we eat nothing but garden produce! Your photos are making me drool! My kids love it when I cook up a huge pot of beans (with a little sausage or bacon) and slice up a watermelon. Ahh, summer please hurry! My seedlings are all so tiny and need some heat! I am inspired to try cucumbers and zucchini after reading this. I love those veggies and am glad to hear that they are good for beginners! Thanks for this! I really want to start growing my own veggies! I am hoping to get some beds put in next year. We just moved here a few months ago so we need to get settled before i’m ready for trying to figure out gardening! Luckily i’m told my part of Irefon allows for almost year round planting of some sort or another. Thank you for sharing this! I’ve always wanted a garden but I haven’t had a yard in a long time! I’m definitely saving this for when I’m ready! Good to see some of the vegetables I picked for my garden this year are on here, as it is my first year gardening! Seems like I’m in for some fun! I’m starting my first garden this year! This is such a huge help in knowing where to begin. Great post! I’ve just started my own little veggie patch with some herbs, tomatoes and kale. (things i should be able to keep alive haha) Everything seems to be growing well except my broccoli plant, It keeps getting attacked by caterpillars. Any tips on how to get rid of them? You might have cabbage worms. They attack anything in the cabbage family like broccoli. Pick off the worms you see by hand. Try dusting the plants with cornmeal or diatomaceous earth. You can spray Bacillus thuringiensis or BT.. it’s a popular choice for organic gardeners. I’ve always wanted to start growing my own vegetables, but I never knew which one to start with! This little guide is perfect for the beginner gardener, thank you! You have amazing garden, Bethany!! I need to go back on this post when I’ll try to garden next Spring! Thank you! I have grand plans for the garden next year. Its getting better each year. This post makes me so excited to garden. We have never had the space, but I soon want to make it a hobby. I’m interested in all the main veggies plus herbs! Gardening is a relaxing hobby that also is productive! These are truly the staples of any garden. When they get better at gardening there are so many different types of vegetables to grow. So true! Start off with the easy ones and slowly work towards the harder veggies. 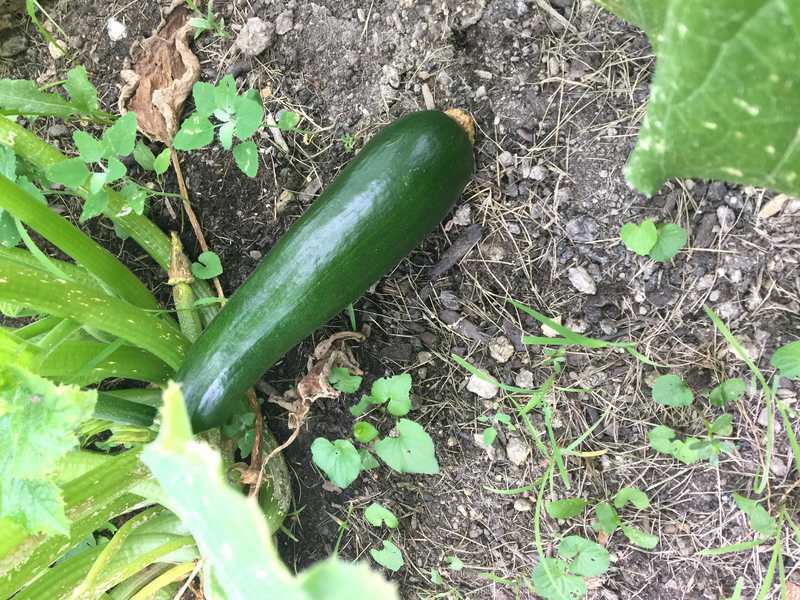 We did zucchini this year. This is a great list! Saving for when we have a little more garden space at our next house. I love this, strawberry as well as herbs like green onion is easy too, and carrot! Strawberries are easy, yet they spread so easily. Chives and basil are two of my favorite, easy herbs to grow. I wonder if my husband read this? We are growing all of these this year! If not, show him it! Once you conquer the easier veggies, you can try some harder varieties. Zucchini tends to grow very well here – and okra! my mom always has tons to give away! I’ve yet to grow okra. Since I live in the north, it is typically a southern crop. I want to try it next year! We started a garden last year and had some great success. We didn’t try lettuce but now I am feeling inspired. Thanks for the tips! Every year is a learning experience, and every year gets better! I love this! We just started gardening this year and I need all the help I can get! Thank you ! Gardening is one of my favorite hobbies. Just start off small. Don’t start too large or it can get overwhelming. Thinning isn’t too bad, but it does take a bit of time. They are edible, so you can add them to salads.